Diosphere Espresso Studio is a student-run café. Founded in 2017 by Susanna Pattison, the café at Diocesan School for Girls in Auckland is a space that allows students to gain barista training while providing their peers and teachers with their daily caffeine fixes. I developed an identity and limited run of posters to promote the café internally. Featured on Klim Type Foundry. The brand mark references the coffee tamper and classic coffee store signage. Conscious of avoiding the usual clichés such as beans, cups and steam, I got all of those ideas out of my system during the ideation phase (slightly untrue but I’ll get to that later). The final mark is more abstract, but still contains several references to coffee and café culture in general. 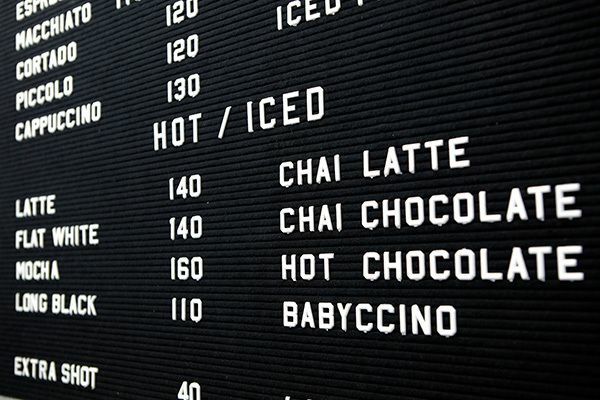 One of the initial concepts I presented was a simple typographic identity, set in a monospaced typeface, in reference to classic coffee shop letterboard signage. The final mark makes use of Klim Type Foundry’s Pitch Sans, which, while still near-monospace, lends more character to the identity. Given that Diosphere’s primary purpose is students’ barista training, we were interested in representing the process of making coffee rather than just the output. The mark’s textured circular background represents the mark made by the face of a tamper, a device used to compress the coffee grounds before extraction. As for the aforementioned white lie, I snuck in a few coffee bean-like shapes by filling in the counters of the ‘O’s.